Synteko Deck Oil - based on renewable raw materials, 7 shades of tint! Synteko Deck oil, which is based on renewable raw materials, has deep penetration and UV-light blockers, providing a very good protection for outdoor timber terraces and patios and furniture. Thermo-processed timber can also be sealed with Deck Oil. Oiled surface do not remain slippery for lengthy periods after being subjected to rain. (R10 class DIN 51130 for wet slip). The product does not contain artificial drying agents such as cobalt nor other harmful chemicals. Hence its low VOC rating. 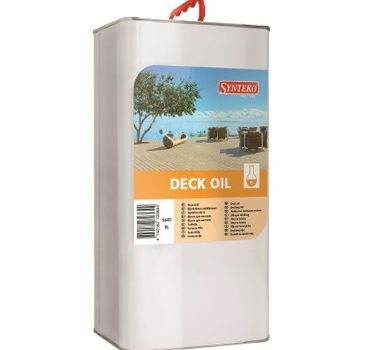 Synteko Deck Oil can be tinted with Synteko tinting paste in seven colour shades. A minimum of two coats must be applied. When the deck is open and experiences excessive sunlight and or rain especially when being subjected to the harsh climatic conditions, a third coat would be preferable. Synteko recommend for longevity and aesthetic appearance, the decking surface should be re-sealed at least at the beginning of each summer as well as at the end of the season. Please note that this recommendation is subject to length and intensity of the season, as well as the vagaries of the weather.